At some workplaces, incidents occur and there’s no thought given to incident investigations. This is a no-no. At others, probably most, incidents occur and are followed by an incident investigation that attempts to identify a single root cause and then put in a corrective action to prevent similar incidents from happening in the future. This is probably the most common response to incidents at organizations. But there are criticisms of that second, common method, which might be considered the traditional safety approach to incidents and incident investigations. One criticism is that it’s overly simplistic, with its emphasis on identifying a single root cause instead of noting the interplay of interrelated systemic issues. Another criticism is that the explanation often–too often–claims that a worker made a poor decision, often the result of not following procedures. And a third is that the corrective action often boils down to simply providing training and perhaps enforcing discipline on the worker who’s thought to be the cause of the problem. In his book Pre-Accident Investigations: Better Questions–An Applied Approach to Operational Learning, Dr. Todd Conklin makes the points above about some of the problems with a traditional safety incident investigation approach at work and makes a recommendation for a different approach: learning teams. In this article, we’ll take a closer look at Conklin’s book and recommendations. As always, we recommend that in addition to reading the article, you get the information straight from the expert as well, so please buy Dr. Conklin’s book (all three of them, really) and/or listen to the video of Dr. Conklin speaking at the ASSE Safety 2017 national conference, which we’ve included at the bottom of this article. So with all that said, let’s get to learning about learning teams for building the safety capacity of your organization. Let’s look at some key points from the book to learn more about the value of learning teams, when to use them, how to construct them, and how to implement them. Learning teams can be used for pre-task/pre-job planning sessions, post-work debriefs, routine safety inspections, job hazard analyses (JHAs), near-misses, and more. And of course, they can also be used after a workplace incident that resulted in an injury, illnesses, or environmental exposure. And that’s the context in which Dr. Conklin most commonly discusses learning teams in this book, although the title and its use of the words “Pre-Accident Investigations” certainly suggests and emphasizes the value of using learning teams to prevent accidents from happening in the first place. For the purposes of this article, we’re going to focus on the use of learning teams after a workplace incident, but remember these other possible (and recommended) uses as well. Who Should Be Included in a Learning Team? The single most important answer to this question is that learning teams should include workers who perform the job. They know the job the best, they know the hazards the best, and they know how work really is done in the work space. 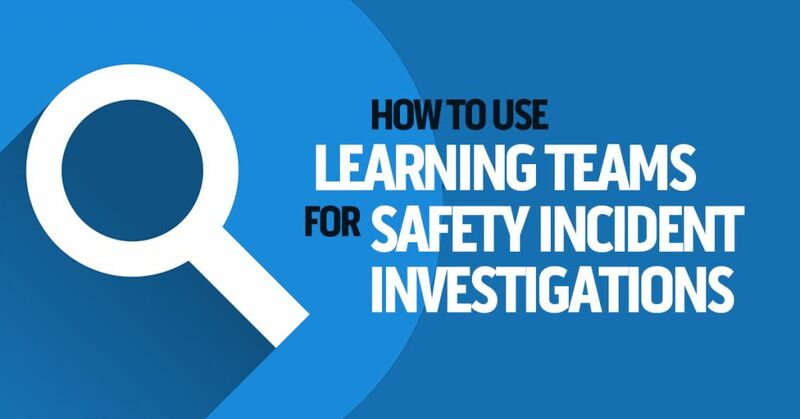 When using a learning team to investigate an incident (the focus of this article, remember), it will be important to include the person(s) involved in the incident plus other workers involved in the work/event/issue. It will also be useful to have a learning team coach. This person understands the purpose of the learning team and will help to explain that process to the other learning team members and will facilitate the learning team process. It’s important to think of this as a support role–the learning team coach shouldn’t be dominating the discussion, and in fact should focus on explaining the general process, asking good questions, recording the answers of everyone else on the learning team, and otherwise facilitate the organizational learning process. There may be different thoughts about involving the workers’ manager. I’d personally vote for including the manager, as communication and trust has to build somewhere, and as that person has a lot to learn from the learning team. It’s important, though, to make sure that manager understands his/her main role in a learning team is to listen, support, and learn. It may also help to have an objective third party participate to provide a fresh set of eyes. The short answer here is because you’ll learn information you didn’t know before, and you can use that information to increase your organization’s capacity for safety. A slightly longer answer is that you should use learning teams that involve employees because the employees know more about the job as its performed than you do, they have a better understanding of when procedures aren’t followed to a “T” and why, and because their combined input will give you a better systemic understanding of the entire context in which the incident occurred. In his book, Dr. Conklin recommends the following process for conducting a learning team after an incident has occurred. In an ideal world, we’d take the time to create learning teams for all sorts of reasons. Why not, who doesn’t want to learn more and more and increase our organization’s capacity for safety? But, here’s where reality kicks in, especially in terms of time, money, staffing resources, production requirements, and work necessities. So, instead of doing a learning team around “everything,” you’ll need to prioritize, doing learning teams sometimes but not all the time. So how do you choose? So that’s a good general guideline. Can you describe and explain how the event/incident occurred? Can you define a benefit from conducting a learning team after an incident occurred? Does your system seem unstable? Are you noting a series of weak signals that might indicate a larger problem? Is the situation/event/incident surprising to you, to workers, and/or to your organization? As a way to prioritize learning events, rank your best and worst procedures. Do you know how work is really done? Are you lying awake at night? And even though this article is focused on using learning teams to learn what happened during an incident, please note the emphasis on incident/event prevention in both lists above, and know that both Dr. Conklin and the Safety Solutions website also suggest considering learning team events after a great or even surprising success in your organization. Once you’ve decided to conduct a learning team, take some time to plan out what you’ll need to do in advance. This might even include things as mundane as knowing where the learning team will meet and getting flip charts prepared. And of course, you’ll have to decide who to invite and actually invite them. In a way, this may be the hardest step of the learning team process. Why? Because it’s going to be natural for everyone to try to explain and fix the problem. Which may sound nice, but it’s not what you want to do at this point. The goal of this session is to just learn. Explain to everyone that all learning team members have different insights and perspectives and that all are valuable. Explain that the goal of session one is to learn/discover as much as possible around context in which the event occurred. Explain that the goal is NOT to solve or fix the problem–at least, the goal is not to do it today. Ask the learning team members a series of questions to help the team fully define exactly what happens in a normal shift on the job and exactly what happened that day leading up to the event. Conklin’s book includes a nice walk-through of these questions–buy the book and check them out. Continually keep the team focused on learning and/or discovery and keep nudging them away from attempts to solve the problem. Another problem you may have is not dominating the discussion. Remember your primary role is facilitation. The workers have the information and the answers. Your job is to listen, take notes, make sure everyone’s heard, and to be supportive. Wrap up learning team session 1 without a “fix” to the problem, and more importantly without even trying to identify a solution. Then, take some time off. Let people walk away from the learning team meeting and give the event and discussion additional thought on the “back burner.” You know how sometimes the best ideas come to you only after a while, or you realize what you should have said only after the opportunity to speak passed. This break allows people to catch up and give more thought to the process. It will also give you a chance to identify others who you should invite to the second session. There’s no magic time for how long to wait. You don’t want to wait too long, because the event may have been severe and also because people tend to forget relatively quickly. There’s some research that shows an overnight pause can be very productive for learning, so taking a break until tomorrow may be a good solution. After your pause, it’s time to hold the second session of the learning team event. Begin the second phase by reviewing what was discussed in the first session. Then, ask learning team members if they have more to add. Remind them that they’re STILL in the learning/discovery mode, not the problem-solving mode. Next, have the time review everything they’ve learned so far. Ask them what information is most important and why it’s important? And next, ask the team to explain the best way to discuss fixing the problem. Have them propose priorities for which problems to address and which not to address, which issues should be fixed first, and of course how to address each problem. This is where you will begin to get actionable recommendations, not only for the initial event, but perhaps for other related issues you were never aware of (this is one of the benefits of adopting a systemic approach instead of trying to narrow down to a single root cause). In this step or phase, you’ll ask the learning team to explain your current defenses. Have them explain which work, which don’t, and why. Have them explain ideas for new defenses, too. Conklin gives a good tip that safety leaders can take information out of this step to experiment with changes on a small scale. This is similar to the emphasis on small-scale prototypes in design thinking for learning. Next, prioritize actions to take to address the problem(s) and move them toward closure. One star–simple solutions that team members can implement themselves. The low-hanging fruit. Have team members identify and implement as many of these as possible. Start with small-scope experiments and, if there’s evidence of effectiveness, increase the scope. Two stars–requires more time and effort, and may necessitate the involvement of management. Three stars–longer-term solutions that will take more time and money. Have each of these three tracks of corrective actions proceed independently; don’t make this a linear process in which you want to complete track 1 before beginning track 2. Conklin refers to this as less of an orderly, sequential, straight-line approach and more of a multi-tracked “blob” approach to increasing safety. (Source: see p. 115-116). Communicate the findings and results of the learning team process to the organization, ensuring that the organizational learning isn’t siloed. To learn more about learning teams, you could do much worse than listen to the recorded podcast below (from Dr. Conklin’s Pre-Accident Investigation podcast series) with Dr. Conklin and Bob Edwards talking about learning teams. Along the same lines, you might also enjoy listening to Dr. Conklin and others discuss issues related to this in this recorded video, which was taken at the ASSE Safety 2017 conference. In addition, you may find this article on helping employees learn to learn relevant in this context as well. Beyond that, we DO recommend you check out this page at Safety Solutions, where they’ve got a lot of additional related stuff that’s very helpful about learning teams. And of course, we remind you to buy the book book Pre-Accident Investigations: Better Questions–An Applied Approach to Operational Learning by Dr. Todd Conklin. Hope you found this article on using learning teams for safety incidents (and other safety organizational learning needs helpful). Let us know if you have any questions. 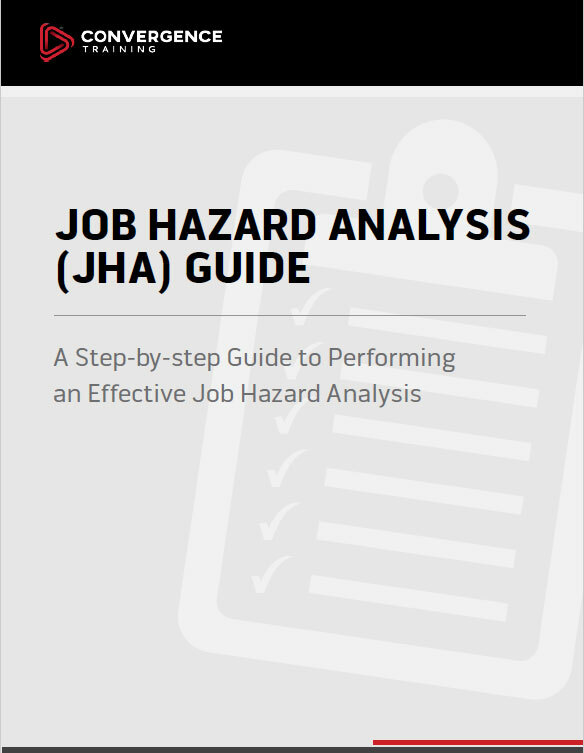 Feel free to download our free guide to performing a JHA before you leave, and remember to include your learning teams in your JHA process.